Big imaginations need big hydration. Our Limited Edition Kids collection is a fun, imaginative way for kids to stay hydrated. Every sip stays icy cold for up to 24 hours so kids can stay refreshed for any adventure – real or imagined! The colorful, easy-to-clean Straw Lid and a durable Flex Boot make this the perfect companion for active families. So choose your child's favorite – Toucan, Butterfly, Frog, or Chameleon – and keep them hydrated all day. As an added bonus, each bottle comes with a custom sticker designed by local Bend, Oregon, artist Megan Myers! 12 oz Kids Limited Edition is rated 4.0 out of 5 by 16. Rated 5 out of 5 by Leoni from Love the durability Great water bottle. Bought for my two girls (4&2). They love. A bit hard for the 2 year old to open but her sister helps her. Very durable and super impressed on how long it keeps cold drinks cold for. Like how you can keep straw in or out. Easy to wash. Rated 5 out of 5 by Portagedave from Awesome for kids Bought this for our granddaughter And it has been everything we hoped for. It’s fun , durable, and keeps everything cold. Rated 5 out of 5 by TTQQ from Great - even for a 1.5year old!!! I'm writing this review because I purchased 2 of these limited edition bottles last summer. One in Frog for my 1.5 year old (at the time) nephew and the other in Butterfly for my 11 year old niece. This is a great product! I read in someone else's review that a 7 year old has trouble opening this - my nephew is now 2 and opens and closes the cap on his own.. and the kid doesn't have the most strength in his arms. Sure the cap leaks, but it says on the description and when you get the bottle that IT IS NOT LEAK PROOF... for goodness sake, its got a straw and two holes (one to drink from and a very tiny one to let air in). I think my 11 year old niece could definitely use the 20ounce bottle vs. this small one - I think this is a great bottle kids 10 and under. Oh, the reason I spent $30 on these bottles is mainly because my nephew would only want to drink water out of my 40 ounce bottle which def is not appropriate for a kid, especially if it's 100% full. I can say, with 100% confidence that this Hydro Flask is his favorite! PS - you're paying for a Hydro Flask, not a plastic bottle from the Disney Store, Target or Walmart! 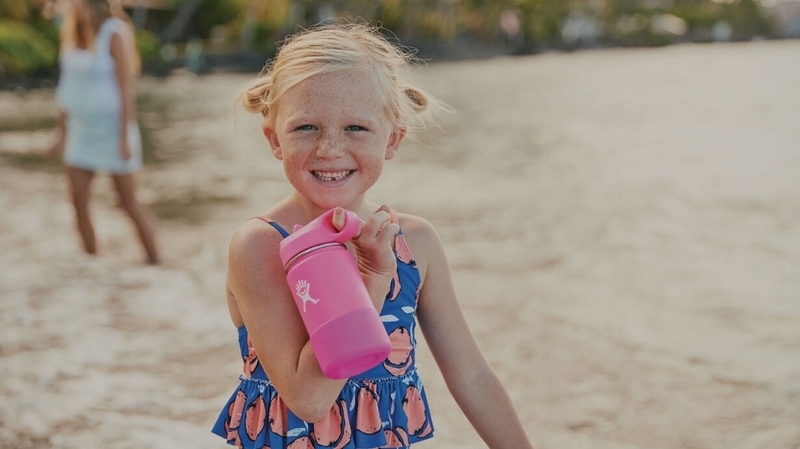 Rated 5 out of 5 by Cheryl0711 from Luna loves her Hydroflask I bought this for my granddaughter and she loves it. Rated 5 out of 5 by Usual from Great Buy My girls love them, so glad I decided to get them! Rated 5 out of 5 by dlesko from Fantastic water bottle! Everyone needs to own a Hydro Flask, you will not be disappointed. Rated 5 out of 5 by Shauntee from Love it This would be a great hydro flasks if it came in a bigger size, all the same colors but bigger. Rated 5 out of 5 by KristenSpillane from Awesome cup I bought two of these cups for my 3 and 5 year olds for camp. They are able to independently use them. The cup never spills unless the straw is upright. I love how cold the water stays. Most of the time we use the cups without even putting the straw in. The kids just tilt the cup backwards and drink. The cups are super easy to clean. I dishwasher clean the tops and hand wash the bottom. The only negative I have found with the cup is that it doesn’t fit in my son’s car seat, it’s too wide. Rated 4 out of 5 by Batman727 from Love the color I bought this and my kids absolutely loved the color! so happy I could get the Limited edition in time! SO amazing! Rated 3 out of 5 by Ys1113 from Looks good, but dents easily I got this a month ago and dropped it once outside in our driveway and it dented in several places. I don’t use it anymore due to the damages and the appearance of the bottle. Besides that, I loved the bottle. Rated 3 out of 5 by Seung from Leaks so much I bought 5 of them for my kid and her friends. I love the colors but all of them tend to leak so much for me to carry around. I wish there was an option to buy this bottle with just a regular wide mouth cap. Rated 2 out of 5 by TeoHannah08 from Little Disappointed It leaks! It doesn't leak all the time but often enough where it's annoying. Rated 1 out of 5 by KimP from Leaks where lid screws onto bottle. I bought this as a gift for my niece for Christmas. She loves it but it leaks where the lid screws onto the bottle. Rated 1 out of 5 by Matt12345 from Poor Design and not worth the price Didn't put much thought into this model and seems like it's just a rip off. I would think the first basic rule to selling water containers is to flip it upside down and not have it leak? This model is geared towards teens and adults, not younger kids because you have to have muscles to open/close the lid so that it does not leak. It's nearly impossible for a 7 year old to open/close this bottle properly on his/her own. On top of that, if compared to the bigger, 18/24oz hydro flask, this model does not keep ice longer than 2-4 hours. Very poor! Don't waste your money on this specific model. Hard plastic, but easy to drink from&mdash; my 2 year old drinks out of it easily! Is this cup spill proof? Not if the straw is pulled open. If closed, yes totally. What age is this item appropriate for? I have a 40 oz straw lid, and my 20month old granddaughter can open it and drink. Obviously the 40 oz is kind of heavy, when full, for her to carry. The kid size would be great for her and her 5 yr old sister. Can you put these in the dishwasher?